To provide excellence in client service, improve customer satisfaction, and capture new markets, RBC, one of North America’s largest financial institutions, is leveraging the talents of a diverse workforce that is representative of the wider community, including the immigrant population. 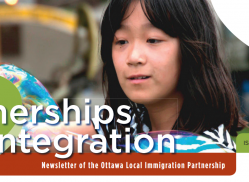 This, according to a new case study released by Hire Immigrants Ottawa (HIO), describes the innovative practices RBC is using in Ottawa to integrate skilled immigrants into their workplace. RBC works closely with immigrant employment networks to access community resources and connect with immigrant job seekers. RBC is a member of HIO’s Employer Council of Champions and Finance Sector working group; it participates in HIO’s cross-cultural competency trainings and coaching events. The bank also collaborates with LASI World Skills, hosting mock interviews for immigrant clients of the Ottawa Job Match Network, with several of its local area managers participating. At these events, RBC managers share information about bank’s skill requirements and provide feedback on immigrants’ interview skills and resume preparation. As well, RBC undertakes a diversity census of staff used to measure progress on representativeness within all levels of the business. An employee language-skill list is used as a shared resource for RBC employees to provide in-person language specific services. For Sue Danahy, Branch Manager at RBC, “It’s a business imperative now. A diverse workforce allows us to better serve a diverse client base, thus attracting more business. It’s this win-win mentality that drives RBC’s business in the marketplace”. To read the full RBC Case Study, visit www.hireimmigrantsottawa.ca.